Since 1992, when Buttafuoco found herself at the center of a senseless tragedy, her last name has become an easy (and surprisingly long-lived) punchline. While most everyone knows the story of her ex-husband, Joey, his relationship with teenaged Amy Fisher, and Fisher&apos;s violent attack on Mary Jo, no one knows the former Mrs. Buttafuoco&apos;s side. In this revealing memoir, Buttafuoco examines the sociopathic manipulation perpetrated by her husband, how he kept her tied to him, and how she finally found the strength to leave. 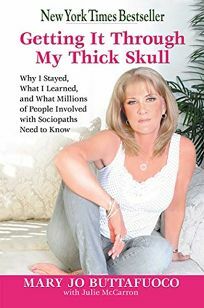 Readers looking for a scandalous rehashing of the Joey-Fisher affair will find surprisingly little (it is, after all, a well-covered 17-year-old story), but Buttafuoco bares her soul in a detailed account of her life, from the high school roots of her relationship with Joey to the healthy, rewarding relationship she currently enjoys. Buttafuoco&apos;s goal is to alert readers to the dangers of sociopathic personalities, as well as to inspire in them the strength to leave and the patience to heal (a mission only slightly undermined by her admission that she does keep in contact with Joey).